After a decade-long career as a videographer with the Associated Press (AP), and frequent collaboration with American and other international news organizations covering the war and other ongoing news stories in Iraq, Ali Al Saedi faced significant threats to himself and the safety of his family as the security situation in Iraq deteriorated. 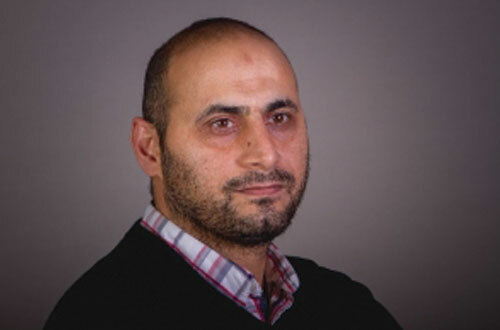 Having applied for refugee status as early as 2003 and the outbreak of war, after a nearly decade long process of applications, interviews and medical tests, Ali, his wife, and their two children – with a third on the way – finally made their way to Boise in 2012 with the help of World Relief. Upon arriving in Boise, a friend of Ali’s was able to help him get an initial job detailing cars at the auto dealership which he managed. While the job at his friend’s auto dealership provided enough money for the family to get by and provided Ali with an opportunity to develop his language skills on the job, Ali says he only viewed this employment as a “survival job” while he looked for employment within his specialty. After several interviews but no subsequent offers he began to feel discouraged saying, “most [fellow refugees] said that it was impossible to get a job, and I was convinced by this.” However, when Ali’s friend suggested he look into the programs of Global Talent Idaho, Ali’s story changed as he describes finding GTI as finding hope. Describing the processes of resume and cover letter writing as well as the mock interview exercises as some of the most helpful services provided by GTI, Ali also tells of the internship program through the Department of Labor being a key component in his success. After receiving the support of GTI staff and volunteers to become more familiar with the culture of the American workplace and business world, Ali’s years of experience quickly landed him a 6-month internship with Idaho Public Television as a video editor, finally working back within his field of expertise as a video editor working to produce shows such as Dialogue and Idaho Reports. After completing the internship Ali did take up a part time job with Idaho Public Television, but felt a longing to return to news media where his career had begun. Emphasizing his thanks for the continued support of GTI and positive and supportive attitude of his current employer, KTVB Idaho’s News Channel 7, Ali says he is proud to be working back in his area of expertise assisting in the editing of Boise’s local news.